The premier dining experience at the Pointe Hilton Tapatio Cliffs Resort (Tapatio is pronounced: tap-uh-tee-oh) is Different Pointe of View. 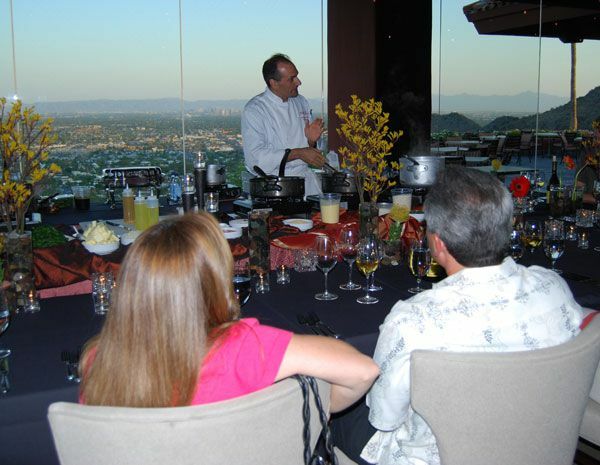 As a matter of fact, Different Pointe of View is one of the best dining experiences in the Greater Phoenix area, incorporating a spectacular view of Phoenix with fine cuisine, great wines, and excellent service. Some people may remember that in the 1980s this resort was one of a triumvirate of Pointe (yes, with an "e" at the end) Resorts. This restaurant, situated atop North Mountain, was called Etienne's Different Pointe of View. Etienne's association with the restaurant ended during that decade and it has since been known as, simply, Different Pointe of View. For years, it has been recognized as one of the finest restaurants in Arizona with an award-winning wine list. It's a winding road up to an elevation 1,800 ft. of where the restaurant sits. In the early days, you weren't allowed to take your own car up to the restaurant, but rather you were transported by limo. Now there are two lanes, you can take your own vehicle to the top, but it's an exciting little drive nonetheless! I had the pleasure of attending one of the Insiders View Winemaker Dinners. Designed for 12 people, this intimate adventure in delightful dining was led by Executive Chef Anthony DeMuro and the Cellar Master and Sommelier for the restaurant. With a view of downtown Phoenix, Arizona in the background, Chef Anthony prepared and explained the evening's multi-course meal which included small plates of Lobster Parmesan Ravioli, Pan Seared Pork Belly, Micro Arugula & Seared Diver Scallop Salad, and Micro Arugula & Seared Diver Scallop Salad, topped off with a Midnight Espresso Cup for dessert. Chef doesn't just present and describe the courses; he prepares them in front of you using locally grown and produced ingredients, where feasible. He will answer your questions (why does he cook only four raviolis at a time? where are the best truffles found? why aluminum pans? why is that your favorite spoon?) but he makes it look very easy! Chef Anthony is neither pompous nor pretentious — it was a very relaxed and pleasant environment at the Chef's table. Of course, when you attend a special dinner at Different Pointe of View you'll have a different menu than the one described here. The Winemaker Dinner menu changes every month. Even if you don't attend a Winemaker Dinner, you'll not find many places in Phoenix for a romantic dining experience better than Different Pointe of View; it is a popular spot for popping the question — of course she'll say yes! Why not have the wedding right on the patio? The Winemaker Dinner will last a few hours, so don't be in a hurry. For the first 45 minutes or so, Chef will be explaining the meal and the process. Until the first course is ready, you'll have wine to enjoy! The wines that are presented during the dinner aren't necessarily the most expensive wines on the restaurant's wine list, but they are intended to complement the food while introducing the guests to wines that they might not be able to buy at local retailers. While there is a lovely patio for regular dining, you'll most likely be seated inside for the Winemaker Dinner because Chef has an entire kitchen set up for the experience. You'll still have a fantastic view, and hopefully a beautiful sunset, as you'll be positioned to watch the Chef in front of the floor-to-ceiling windows overlooking the Valley of the Sun. Individual course portions were not large. Small plates spread out over the evening left us satisfied but not stuffed. Take the opportunity to get to know the people seated near you while you enjoy your wine, which was refilled as often as we liked. If you have any dietary restrictions or you are an especially picky eater, you might want to check the menu first. Chef can work around some dietary issues for you, but the items are generally prepared for everyone the same way, with the same sauces and such. You won't be able to vary from the menu too much or request substitutions at the dinner. The cost of a Winemaker Dinner at Different Pointe of View is about $99 plus tax and tip per person. That price includes the wine. (2016/2017). This dining experience would make a wonderful special occasion event. The Winemaker Dinners are held monthly, October through May. Visit Different Pointe of View online to see the regular menu or other special events that might be offered. Visit Different Pointe of View online.